Last week I was made aware of a particularly disturbing publication. 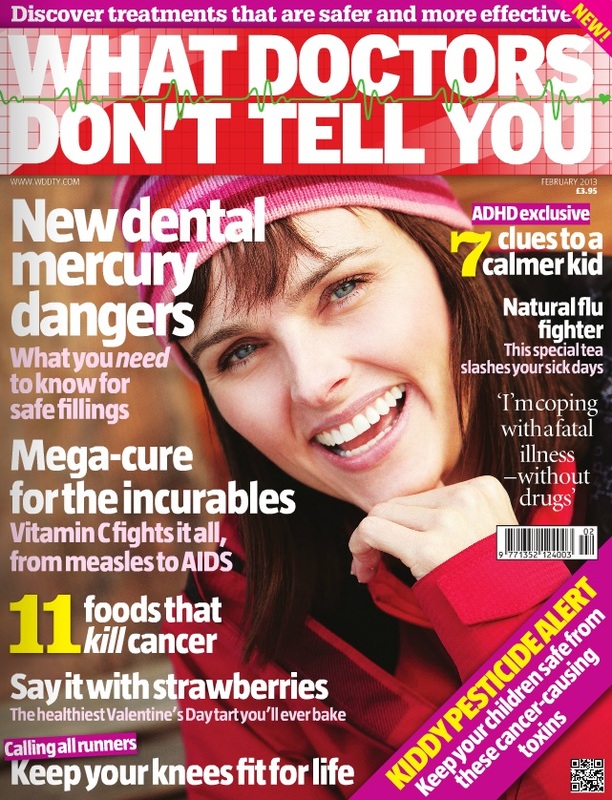 What Doctors Don’t Tell you (WDDTY) is a magazine available for sale in UK shops that peddles dangerous “natural alternatives” to “big pharma” – and they’re taking their dangerous nonsense to the next step. Originally starting as a website, and now in print form, WDDTY centres around a number of conspiracy theories all of which, they claim, result in your doctors withholding cheap and natural solutions to health problems from you – the patient. One of their most frequently repeated (and saying something many times doesn’t make it true) claims is that our doctors are so far in bed with “big pharma” (drug companies) that they withhold these easy cures from us in order to line their own pockets. That’s quite simply, and objectively, nonsense. If the NHS could cure a patient by prescribing a banana and herb tea instead of spending hundreds, sometimes tens of thousands, on medication they would do so. Far be it from WDDTY to miss out on a trick though. Their poorly written, badly researched and often dangerous articles are frequently accompanied by an advert for a ludicrously expensive vitamin supplement or miracle cream. So, WDDTY are annoyed that doctors are keeping us in the dark to make money from/for “big pharma”, but it’s OK to spout pseudo-science in order to push some hideously over priced potions? Hypocrisy thy name art WDDTY. 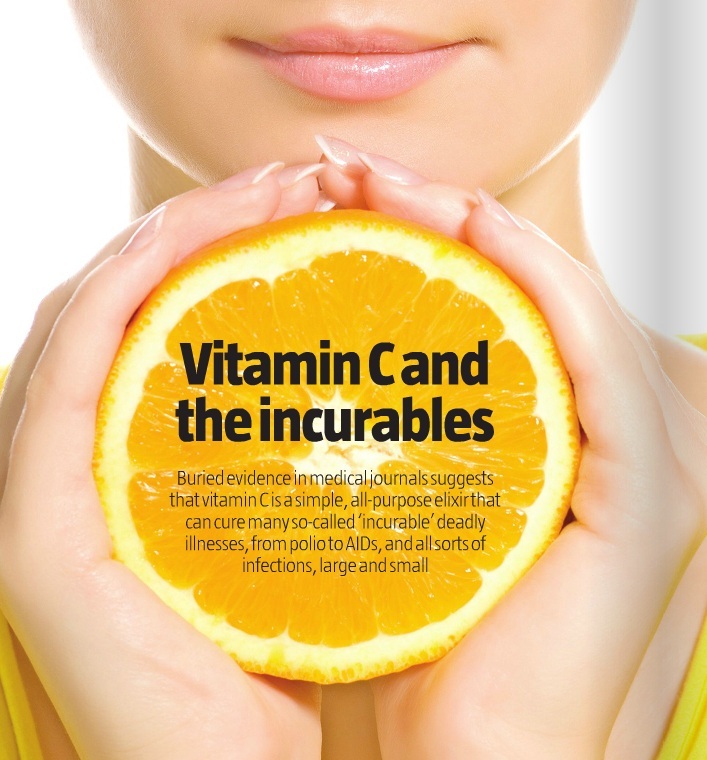 Many of their articles focus on low impact conditions such as acne or hayfever but earlier this year they published a piece entitled ‘Mega-cure for the incurables – Vitamin C fights it all from AIDS to measles’. The article claims that massive doses of Vitamin C can slow or even cure HIV, this is all based on decade old “research” that has been dis-proven time and time again in the subsequent years. HIV is a complex retrovirus, for which there is no known cure. Billions upon billions of pounds, dollars and euros have been spent over the last thirty years in the attempt to both manage and cure HIV. If there was a cure already we’d know about it, and the pharmaceutical companies would be busy selling a vaccine to every person on the planet. Now, I get hundreds of emails each day – many of which are peddling some magic cure to HIV (the best one I had was rubbing beetroot on your feet). These people are out there, that’s a fact. But there’s a difference between a badly written email or blog claiming that someone cured their own HIV with pumpkin seeds, and a magazine using dis-proven science to push their own dangerous ideas. The old adage “don’t believe everything that you read” seems appropriate here – the thing is many people do. By printing this dangerous nonsense in a glossy magazine and selling it through reputable high street stores they automatically gain a certain amount of credibility. I mean if an “expert” has written it and a magazine has printed it then it must be true – no? Starting HIV treatment can be a big deal for lots of people. Your medication has to be taken at the same time every day – for the rest of your life. It can come with side-effects, and serves as a daily reminder that you’re living with HIV. So it’s far from surprising that some people wish to delay starting treatment for as long as possible. These people, these vulnerable and worried people, are exactly the people who’ll come to harm from the nonsense peddled in WDDTY. Scared of HIV medication? Worry not, a glass of orange juice will cure that pesky HIV for you. Left unchecked and untreated over time a HIV infection will destroy your immune system and lead to death – that’s a fact. Thanks to modern medication we can live a full healthy life, but a tangerine isn’t a cure. I’m asking, pleading if I have to, with the stores that stock WDDTY (including Tesco, Sainsburys, Waitrose and WHSmith) that they remove this dangerous publication from their shelves. Store buyers and management: If you have a bad batch of burgers you withdraw them from sale to prevent your customers from e-coli. If you have a defective toy you recall it to stop children choking. You wouldn’t sell a magazine that promoted eating disorders or suicide. So I’m asking you to remove ‘What Doctors Don’t Tell You’ from your magazine selection before someone with HIV, Cancer or Diabetes follows these poisonous recommendations and dies as a result. By selling the magazine in your stores you are both legitimising WDDTY’s message and opening yourself up to potential law suits. Do the right thing here and withdraw WDDTY from sale, today. Previous articleCan we say “consenting adults”? Excellent piece, Tom! I remember being talked into the vitamin C “cure” in 1988 when you could only get AZT if you had ARC or aids. I won’t go into the details in case some idiot tries it, but the net result of it is some of the most expensive diarrhoea you ever had. Not good. It was highly promoted by a denialist group in London whose reasoning when someone died with aids was that “they didn’t have a strong enough will to survive”. It was with their encouragement that an ex-boyfriend of mine stopped taking the antibiotics he had been taking for septicaemia. He was also my partner’s ex-boyfriend and had always been the healthiest of the three of us until he started going in for crank cures. I’m not against complementary medicine, using meditative techniques myself, but complementary medicine is just what its name says: a complement to allopathic medicines such as our anti-virals. Whether they have some sort of physical effect or are merely self-hypnosis makes no difference: if they make you feel better, by all means try them. But don’t stop your prescription meds! But this vitamin C scam, approaching its thirtieth birthday in the HIV field is a bare-faced attempt to promote unnecessary, harmful amounts of vitamin C, verging on the criminal. Thank you for writing such a calm, reasoned article. My anger would have got the better of me! You may be interested in our complaints to the Advertising Standards Authority about adverts in this magazine. There were 11 informally resolved cases and 11 adjudications on 26 adverts, giving a total of 54 breaches of the ASA’s CAP Code – all from just the first two issues of the magazine (September and October 2012). Is it not about time that the Government cracked down on those publishing this sort of nonsense which flies in the face of all properly conducted randomised trials. What I mean is you cannot make a claim for a product to “cure” or “help” a condition unless this has been shown to be the case by a properly conducted randomised trial. If you are claiming a medicinal benefit then it is a medicine and should be tested. It is not only these peddlars of snake oil and water (homeopathic treatments) who need curbing there are also the fake healers who believe prayer can cure anything. The simple requirement is prove it before you can make a claim. The ASA is the body charged with compiling and enforcing advertising rules. They do a very good job of that and they require a high level of scientific substantiation (including RCTs where appropriate) for any claim that’s challenged, but their powers are somewhat limited. However, they can only consider adverts, not articles not specifically advertising a product. There are certainly issues of free speech around all this and it is a very complex area but I’m not I’d want the Government dictating what people can and cannot say. However, a person’s right of free speech is not the same as a right to be heard – and that includes through a magazine being distributed and sold. If alternative therapies like Alexander Technique can go in for a randomised trial on back pain and obtain results that show it is beneficial compared to placebo, normal massage and or painkillers there is in my view no reason why other complementary/alternative therapies should not submit themselves to the same scientific scrutiny. Of course it does help if the therapy actually does work and provide measurable benefits. This is in my view not an issue of free speech. We recently had the panic in South Wales over getting children vaccinated for measles… In large part this was about denialists promoting a point of view that vaccines were harmful especially the MMR vaccine… It is an issue about public health and onward transmission of an illness, be it measles or some other infectious agent like HIV. In the days before the rubella vaccine one of my Aunts contracted the disease. The child was born deaf blind and severely brain damaged and with other major physical problems. He died within the year. I think some of the problem is that there have been times where the emphasis from the allopathic medical profession and the “big Parma” has resulted in important research findings being largely ignored particularly while expensively developed drugs were still under patent, until a journalist spots it and writes one of those “what they don’t want you to know” type articles, which the sensationalist and easily led will hold up as proof that we can’t trust the any of the motivations of the allopathic profession and their support industry. Add to that, the history of “Big Pharma” sales representatives offering anything from free pens to holidays to those with influence over purchasing and prescribing decisions, and where it still goes on at present, it is still remembered by those who are looking for justifications to distrust them. This is an interesting and very well written article about a very dangerous magazine to hit the shelves of your newsagents, etc. I have had people tell me that various natural foods like Tumeric can cure tumours. Well if it was the case I’d be cured of my tumours by now. I have a lot to thank the medical profession for s far. They have extended my life by six years so far by diagnosing and treating effectively my pituitary tumour, and now they think the have discovered further tumours, I will not be resorting to some witch doctor claims to cure those ones either. Newsagents and supermarkets PLEASE REMOVE THIS DANGEROUS MAGAZINE FROM YOUR SHELVES! Well done to the author for exposing this! This is awful to read, and to me Dangerous wild claims by a magazine that obviously doesnt have a clue whats its printing. As for vitamins yes their good in their own way and we need them in the right amounts, but they are even dangerous to be taken in larger amounts. As for HIV they could prove fatal even, as it is something to take up with your doctor or consultant at your clinic, some medications esp, HIV will not work or not work properly with certain vitamins, this I found out for myself by the asking at the my hospital a question about Luton Gold for eyesight claims . One of the Vitamins in it stopped meds from working properly or not working at all. People have to ask specialist in each field of medication to find out the truth before following such wild claims on both the advantages and disadvantages of whatever they intend trying . Always seek a medical opinion dont follow rumours or wild claims . And these publishers should be held to account for such claims without the proper medical back up to prove them . Turmeric has shown “some” promise and is being actively researched but no medical professional would ever say it cures … they may, yet, discover it helps, however. As a scientist this all frankly disgusts me! Praying on the less educated in society to sell its toilet paper magazine!